More than forty corpses fill the cold Chicago basement, but no crime has been committed here. After all, there are supposed to be bodies in the city morgue. Tonight, one is attracting particular attention: a beautiful young woman whose apparent suicide captured the imagination of every newspaper editor in town. Learning how and why she died is too great a task for any cub reporter. Only Detective Bill Crane is up to the job. 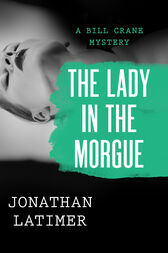 A few minutes after Crane wakes from a nap in the morgue, the mysterious woman’s body has disappeared. With the howls of the mental patients as a soundtrack, Crane leads the police on a wild search through the hospital and across Chicago, stopping for a nap or a cocktail whenever the situation demands. It may be a matter of life and death, but that is no reason to rush. Jonathan Latimer (1906–1983) was a bestselling author and screenwriter. Born in Chicago, he began his career as a crime reporter for the Herald Examiner, working there until 1935, when he set out on a twisting road to Hollywood, which included stints as a dude rancher, a stunt man, and a publicist. In the late 1930s he began writing screenplays for MGM, producing the scripts for several classic noir films, including The Big Clock (1948) and the adaptation of Dashiell Hammett’s The Glass Key (1942), which starred Alan Ladd. All the while, Latimer was writing fast-paced mystery novels such as The Lady in the Morgue (1936) and The Dead Don’t Care (1938). After fighting in World War II, he returned to Hollywood, where he continued writing novels and became a staff writer for the Perry Mason show.